Scuttlebutt Fuzz: What the heck?!? Am I blind? Sunday, we were slow in the morning, typical for a Sunday. I decided to try my hand on the rifle range. Its been over a year since I last shot. Initially, my hits were all over the place - - hitting the target but all over in the 1 and 2 areas (horrible) I stopped and asked myself, "What the heck? Are you blind?" Well, actually, yes, I was, sort of. I forget that I am left eye dominant. So I tend to close my right eye when I'm "looking" through the sight. In effect, I'm shooting with my eyes closed. 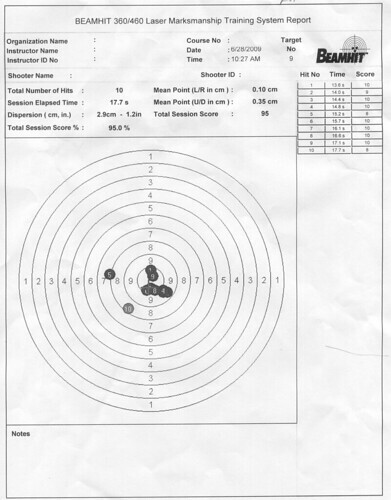 The fact that I hit the target, a simulated 200 or 300 yards away is amazing (I think anyway). Once I figured myself out and coordinated (eyes open) I shot a few sets. I showed my sheets to the Marines for some analysis and this is what I found out. 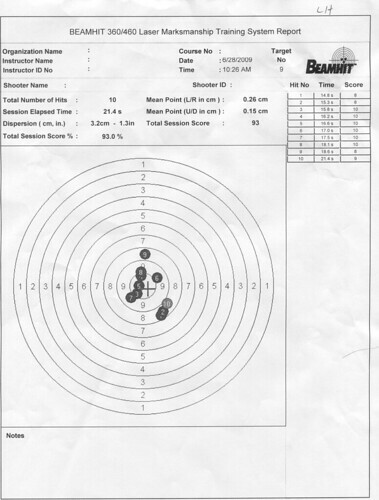 My right handed shooting, shots 5 and 10 were off because of muscle control (that is the direction the rifle went when I relaxed on those shots. Left handed, my "up and down" pattern was due to breathing. I was probably more relaxed with my left hand because it seemed more normal to have my left eye open as I aimed. The Marines gave me some coaching on breathing -- so next time I'll try to remember what they told me and see if I can get any better. Left handed, I shot about what I shot right handed last year. Right handed, I'm 2% points better than last year. So now the competitive person I am wants to practice so I can get better. I want all 10s, consistently, gosh-darn-it!